Heading south from Rome, we decided to take the scenic route down to the Amalfi Coast; scenic in this case being our euphemism for “free.” We avoided the Autostrada toll freeway, swung around the freeway that circles around Rome, turned south on SS148 and settled in, all of us humming Dean Martin’s “Arrivederci Roma.” It was about 9:30 in the morning and it would take 5-6 hours to make it to our destination of Praiano on the Amalfi Coast. We called it the scenic route and after 15 minutes we realized that our nickname for this road was appropriate, but in a very different way. Our first glimpse of the “scenery” came near the town of Pomezia. On the side of the highway we whizzed by a young woman with heavy makeup, hot pants and see-through halter top awkwardly walking alone in extremely high stiletto heels. In the flash of a second we had passed her and I looked in the rear-view mirror but a large truck blocked my view. Did I really see that? I told my wife that I thought that I’d just seen a prostitute on the side of the freeway and she laughed. Five minutes later another scantily-clad woman walked near a “semi” truck that had pulled over to the side of the road. “Look, another one!” I said. Ten minutes later we saw two women sitting on the guard rail, dressed for work. At this point the kids, who had been reading in the back seat, became interested. “What are they doing?” asked my daughter. “Well, they’re prostitutes looking for customers on the freeway,” I said delicately. 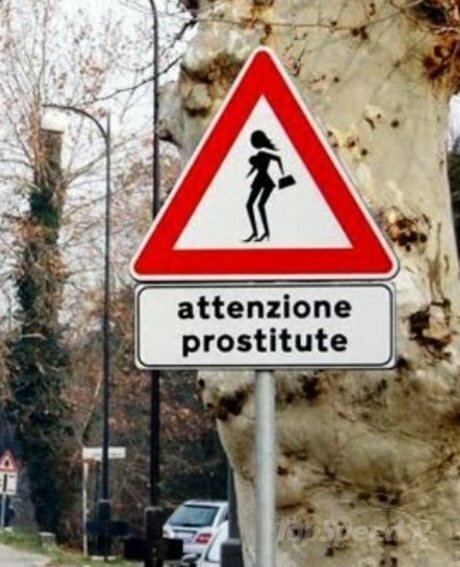 This led to a short discussion about prostitution and how it might work here on an Italian freeway. We tried to honestly answer their questions as quickly as possible in order to end our impromptu homeschooling lesson and get their minds focused on something else. My wife and I often tell ourselves that our kids are getting a great education by traveling with us, perhaps in part to reassure ourselves that they’re not missing out on too much back home. This was definitely something that they would not be getting in the classroom. 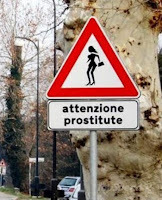 Fifteen minutes later we saw another working girl walking through the gravel on the side of the road in her high heels. Every few miles there were “turn out” lanes that allowed cars and trucks to make stops for a variety of reasons. “Love lanes,” said my wife, coining the term as we passed another truck pulled over to the side of the road. We didn’t see a girl around the truck, but on this road any truck pulled off to the side was immediately suspect. As we drove on for the next hour, every time we saw a truck parked on the side of the road, we looked for hookers. Guilty until proven innocent. That’s life in the Love Lane.